Roads remain closed and hundreds of families are in temporary shelter after floods swept through England. Flood water is continuing to rise in some areas and more showers are predicted, but forecasters say there will be no repeat of Monday's deluge. The floods, which were most severe in Yorkshire, Lincolnshire and the Midlands, have claimed four lives. 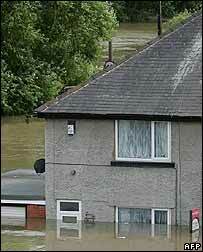 The Association of British Insurers says the overall cost of the floods will run into hundreds of millions.